The back is a vital part of the human body which provides structure and support. It enables you to bend, stretch and twist your body as well as maintain an upright posture. 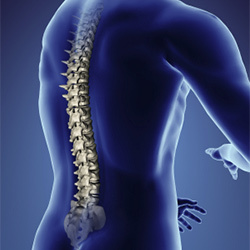 It also provides support and protection for the spinal cord. But things can and do go wrong which requires treatment from our osteopathy clinics here at Harley Street. The back or backbone to be more precise is a strong, flexible column which consists of 24 ring-shaped bones or vertebrae. In between the vertebrae are spongy pads, made of fibrous cartilage which acts as shock absorbers. These vertebrae are further supported by muscles, tendons and ligaments around the sides which also control the movements of the back. Each vertebra has a hole within its centre which the spinal cord passes through. The spinal cord consists of a bundle of nerves which transmits signals from the brain to the rest of the body. The back is a complex part of the anatomy which due to the demands placed upon it, is prone to disease, illness and injury. Back problems, for example ‘back ache’, account for a large percentage of work related sick absences in the UK and are amongst the more common complaints seen by family doctors. Back pain is the most common back problem which is often caused by a stress or strain, e.g. lifting a heavy object or slouching in front of a computer. Excessive strain on the tendons, muscles or ligaments around the spine will result in painful spasms and restricted movements, causing pain and discomfort. This depends on the severity of the problem, the duration and your overall health. Our osteopath clinics treat a wide range of back and spine problems caused by poor posture, repetitive actions, bending or turning awkwardly or standing upright for a long period of time. This also includes sports injuries, arthritis and stress related problems. Surgery is only performed as a last resort. You may be advised to make a few changes to your lifestyle such as losing weight (if you are overweight), applying an ice pack to the affected area and moving around as much as possible.